Reading and share top 3 famous quotes and sayings about Feminism And Marriage by famous authors and people. Browse top 3 famous quotes and sayings about Feminism And Marriage by most favorite authors. 1. "Two ideas are opposed — not concepts or abstractions, but Ideas which were in the blood of men before they were formulated by the minds of men. 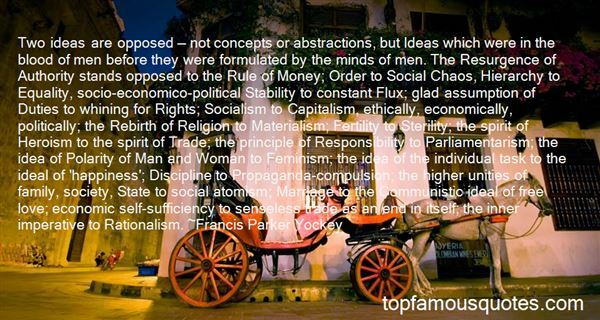 The Resurgence of Authority stands opposed to the Rule of Money; Order to Social Chaos, Hierarchy to Equality, socio-economico-political Stability to constant Flux; glad assumption of Duties to whining for Rights; Socialism to Capitalism, ethically, economically, politically; the Rebirth of Religion to Materialism; Fertility to Sterility; the spirit of Heroism to the spirit of Trade; the principle of Responsibility to Parliamentarism; the idea of Polarity of Man and Woman to Feminism; the idea of the individual task to the ideal of ‘happiness'; Discipline to Propaganda-compulsion; the higher unities of family, society, State to social atomism; Marriage to the Communistic ideal of free love; economic self-sufficiency to senseless trade as an end in itself; the inner imperative to Rationalism." 2. 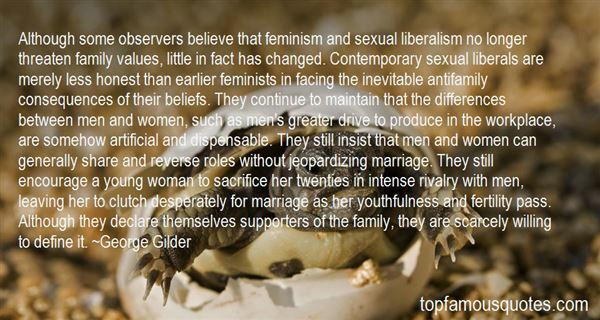 "Although some observers believe that feminism and sexual liberalism no longer threaten family values, little in fact has changed. Contemporary sexual liberals are merely less honest than earlier feminists in facing the inevitable antifamily consequences of their beliefs. They continue to maintain that the differences between men and women, such as men's greater drive to produce in the workplace, are somehow artificial and dispensable. They still insist that men and women can generally share and reverse roles without jeopardizing marriage. They still encourage a young woman to sacrifice her twenties in intense rivalry with men, leaving her to clutch desperately for marriage as her youthfulness and fertility pass. Although they declare themselves supporters of the family, they are scarcely willing to define it." 3. "Feminism is dated? 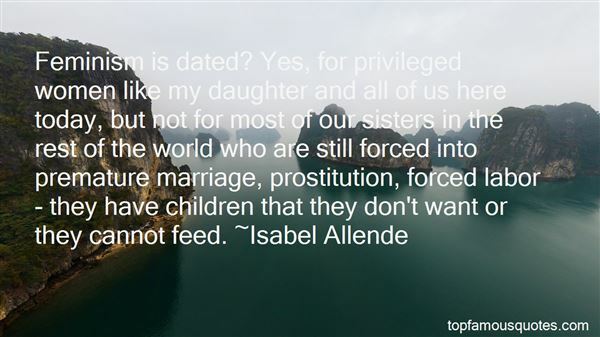 Yes, for privileged women like my daughter and all of us here today, but not for most of our sisters in the rest of the world who are still forced into premature marriage, prostitution, forced labor - they have children that they don't want or they cannot feed." We're going forward, but nothing changes."